So that explained the oversized baby’s bottle she was wielding in one hand, a spatula in the other. Thanking Mary, I sat myself down at the big wooden table, ready to fuel up and excited at the prospect of flexing my calf-feeding muscles. As a non-farmer in the company of farmers, I sometimes wonder if I’m more of a hinderance than a help around the place — particularly during this busy time of year. I often wish there was more that I could do beyond cooing over the baby animals, so I was delighted to have been delegated this simple yet credible task. Fed and watered, I pulled on my trusty purple wellies, noting the muck that had gathered in the soles. I wasn’t sure whether to relish or lament the fact that they were no longer the tell-tale, squeaky clean boots of a newbie-to- the-farm. However, it would take more than a pair of scuffed-up wellies to pass me off as a farmer, and I doubt my hot-pink raincoat or shellac manicure were doing me any favours in that regard . . . I took the litre of beastings Mary had warmed for the calf, and navigated my way across the straw-covered floor of the sheep shed to join Jack. I wondered if the calf in question was feeling at all self-conscious, she being the only bovine in a shed-full of sheep. If she was, she didn’t show it, trotting over to greet us, no doubt well aware that we’d come bearing food. A Charolais, all spindly legs, creamy coat and blue bright, brown eyes, she looked spritely, if a little small. I asked Jack what was wrong with her; why was she in there in the first place? I was horrified to learn that her Mam had been kicking her and refusing to let her feed, therefore giving Jack no choice but to separate the two. She was one of a set of twins, and the mother cow had evidently decided that one was enough, making her dislike for the other known in no uncertain terms. I felt terrible for the poor little thing. Premature, underweight, and subsequently and literally kicked out by her mother, the calf hadn’t had much luck in life thus far. I felt compelled to make it up to her, to restore her faith in the world. 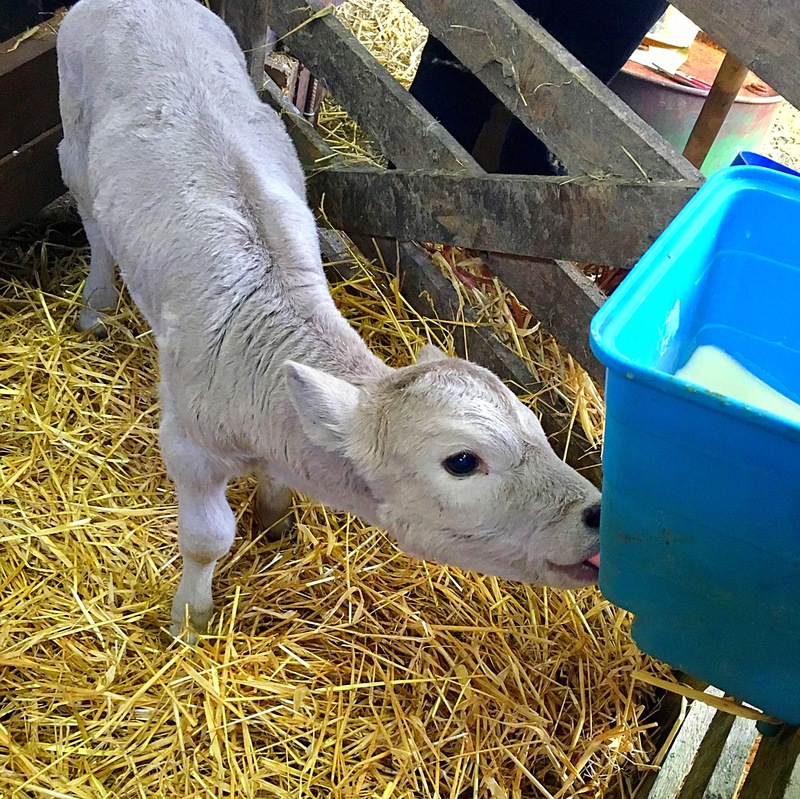 I took great care in pouring the beastings into the blue plastic feeder that Jack had attached to the side of her pen and watched happily as the baby animal latched on and drank with gusto. As she yanked at the teat that obviously wasn’t delivering fast enough, I felt a rush of pride at the thought that I might play some small part in this calf’s survival. Because that’s what it’s all about at this time of year, I think: the willingness to pitch in—farmer or not— as and when needed. My contribution mightn’t have been much in the grand scheme of things on a farm that’s set to welcome close to 500 lambs and upwards of 70 calves in the coming months, but it saved someone else a trip to the yard, and I know it means something to Jack, too, when I show a genuine interest in his world. Besides, when there’s a homemade dinner in the mix, sure who could complain? A version of this post was previously published in the Irish Farmers Journal / Irish Country Living magazine.